REAL OR FAKE ? MAKE sure you don't get ripped off! Since launching the Ezyroller in 2009 in Australia, what an amazing ride we have had! We’ve received so much positive feedback from our thousands of customers (kids and parents, schools, day-care centers… ) our retailers, the media, etc… One of our customers has bought nine Ezyrollers for her grandchildren, family and friends - that’s more than a good customer; that’s a raving fan! We’re also aware of many kids with special needs (low/no vision; phobia of falling; spina bifida on the Junior model) who are enjoying the Ezyroller and that makes us very proud. sadly - our success has attracted the wrong kind of attention. 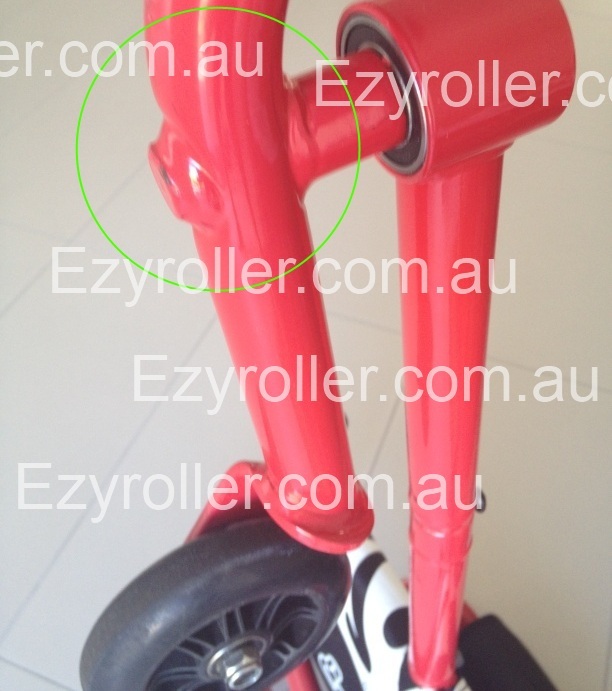 Unfortunately since roughly late 2011, we have seen a number of Ezyroller “knock-offs” appear on the local market. We’ll go into lot’s more detail below but in a nutshell, these are inferior products sold by operators that are deceiving the public as well ripping off the work and achievements of the original Ezyroller team. These operators often operate from pop-up stores, dodgy internet sites, market stalls and the like. In “business” one day, gone the next. We’ve now decided to raise this issue and write this piece because in most cases, consumers are not aware that they are being sold a fake and ripped off. Too many times we’ve had a call from someone who thought they’d gotten a great deal and then had their product fail or break down. Sadly when they contact us there’s not much we can do for them beyond explaining what they’ve been a victim of. So we hope to prevent as many of these situations as possible by documenting the issue. 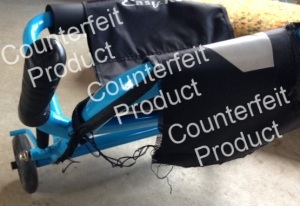 A few months ago, we bought a counterfeit Ezyroller in a pop-up store in Sydney Eastern suburbs. The store had set up for Christmas and has since closed down. The price was indeed extremely low…But that’s not to say it was good value. The first problem occured straight out of the box: the engineering was so bad (threading of the bolts) that we were never able to assemble the product! On the left - the genuine Ezyroller. On the right - the counterfeit product that was purchased in Bondi Junction. Weaker components. There is no secret: to offer a cheap product, corners must be cut. The counterfeit products we have seen have thinner components with less steel (see photo). This obviously impacts the strength of the component and potentially safety. The workmanship will also be of a lesser quality. Top - Genuine Ezyroller component. Bottom - Counterfeit (smaller/weaker). Note poor soldering. Weak Paddle: One of the key components of the Ezyroller Classic is the foot paddle. This component actually gets quite a lot of force applied and stress during use, especially with older/heavier riders - meaning it has to be super solid. On the genuine Ezyroller, we have reinforced soldering (underneath) as well as a high quality mechanical joint. We’ve been called by several consumers having bought a counterfeit where one or both of these components have failed. Weak specs & poor workmanship - cheap! Counterfeit products often break at the paddle. This is the genuine Ezyroller paddle. Note the very reinforced soldering. We've never had a broken one in 5 years! More weak components - We recently came accross another counterfeit product with a failing component. In this case the seat which disintegrated not long after purchase. Consumer also indicated that one of the foot-paddle protectors was splitting. Also note the name of the product in the background. This is not the spelling of the genuine product and clearly signals a counterfeit. Seat on this counterfeit product disintegrated shortly after purchase. Product may not assemble. To cut costs, counterfeiters have to lower quality standards. This will lead to poor workmanship, lesser or no quality control which potentially means difficulty or impossibility to assemble. Often, there is no one to turn to for help if that happens. Unsafe design. 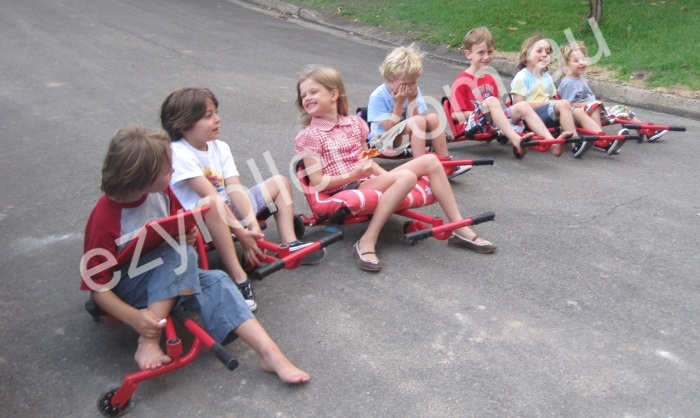 We’ve seen counterfeits where the foot-paddle at the front of the Ezyroller (Classic) is extended by assembling multiple extensions to each other. This is clearly structurally much weaker than the genuine Ezyroller which boasts two sturdy extension bars, used individually, not together. We have had multiple instances of calls/emails from people who were missing components, leaflets, bolts, tools from the very cheap (and counterfeit) product they had been sold. Sadly we are not able to help in those circumstances. Of course in the very rare occasions where something is missing from one of our products, we promptly send out a replacement at no cost. The paint used in genuine Ezyrollers is specified to be non-toxic in particular with respect to its lead and chromium content. Yes this paint is more difficult to produce and more expensive. However, counterfeit/fake products that have been tested by independent labs in the past, have been found to use paint that contains 20 times the approved/safe lead content and 7 times the Chromium content. That’s just not safe and these products should just not be sold or used. - Limited choice of models/colours. Counterfeits do not come in all the colours that are available in the genuine Ezyroller product range. - Stealing copyright and trademark. 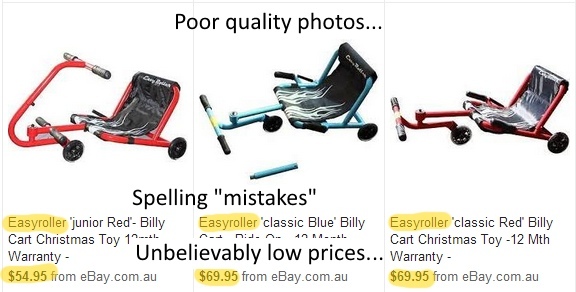 Clearly these products are fakes intended to rip off the public as well as Ezyroller Ltd. They use trademarks, designs, images, packaging to which they have no rights. 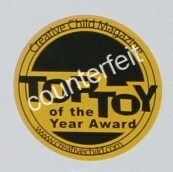 Counterfeit award. They can't even print properly! How do I know I am buying a genuine Ezyroller? By buying from our online store or one of our authorised retailers, you can rest assured you are purchasing a high quality product backed up by us. If you are in doubt, we are most happy to help you determine if what you are being offered is a genuine or a fake. Just email us at info@ezyroller.com.au with the details of what you are considering and we’ll gladly help determine what you’re being offered.